The Tantus PLK405W 40 inch tabletop LCD TV sets a new standard for excellence in picture quality, sound and design. The 40-inch Widescreen size Tantus PLK405W wholeheartedly embodies these elements. Images are flicker free and sharp thanks to the built-in progressive scan line doubler system that upconverts all broadcast and video signals to 480P resolution for outstanding clarity and brilliance. Housed in an elegant chassis with a protective screen cover, the PLK405W is sure to fit in with most any decor. An internal 30-watt amplifier system combined with a sophisticated two-way speaker system ensures the brilliant picture is accompanied by superb sound. An advanced on-screen display and universal remote control makes setting up and using the advanced functions of the PLK-405W a snap. Of course a full complement of input and output terminals including component video and S-Video inputs is provided, allowing the PLK-405W to become the treasured centerpiece for the most sophisticated home theater entertainment system. As the former owner of a custom A/V business in Colorado Springs, I purchased this TV for demos and personal viewing until the lamp finally gave out on me a few months ago. I'm a TV addict and watch movies daily along with regular TV shows and the lamp lasted nearly 11 years...astounding!!! Obviously, this product is obsolete at this date but I have to say I'm extremely pleased with the performance and manufacturing of this TV. 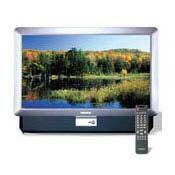 It's considered a EDTV with a progressive scan LCD Lamp. I've sold this product to many customers over the years with not a single complaint or return! I can't say that about some of the other brands I've sold. I've been a real Samsung fan because of that. With the replacement lamp currrently costing $127 I plan on getting it back up and running. Not bad for a nice 40 inch flat screen TV. The colors and blackness are really good, no pixelization, Again, not HDTV, but for most TV shows and news, who cares! I don't need to see every pimple and facial hair on the news anchor's face. will not allow progressive scan (480p) input from component video imputs...will only accept interlaced video signals; lamp wears out too quickly and VERY expensive to replace. Overall I am VERY surpised/pleased with this LCD rear-projection TV. Color, contrast, and overall picture quality is quite nice. I've watch hundreds of DVD's on this TV and I've been very satisfied. Compared to many other rear-projection TV's, this one is superior is picture quality. If you need a large widesreen, table-top TV I recommend this one! Samsung now has this TV in an HDTV model and the PLK405W is no longer a model in thier line-up...it was replaced by the SLK407W. I recently purchased a progressive scan DVD player, but I can not use the player's progessive output because the TV will NOT accept a progressive video signal, only interlaced. BUMMER! But, the TV still converts the interlaced signal into progressive scan so I'm not complaining TOO much, it's just that I would have a better progessive scan image directly from the DVD player! Something to be aware of for my next TV purchase. By the way, the new SLK407W model has a separate component video input for 480p video feeds, the other one is for 480i feeds!! Just my luck.